HONDIUS - Asiae Nova Descriptio..
HONDIUS, J. - Asiae Nova Descriptio..
Asiae Nova Descriptio.. - HONDIUS, J. Size : 14.7 x 19.7 inches. / 37.3 x 50.1 cm. Colouring : In attractive colours. 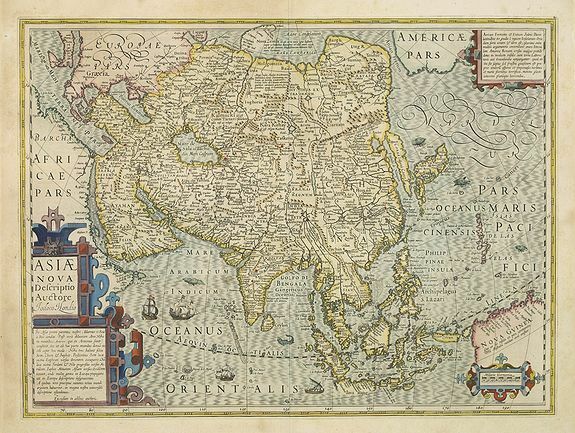 Description :Several sources appear to have been used in the compilation of this map, including the Portuguese Jesuits Luis Teixeira (1595) for Japan, and Luis Jorgede Barbuda (1584) for details of China. Korea is depicted as an island. Recent discoveries of Barentsz. are cited. Parts of America and New Guinea are shown. Condition : Paper browning as usual. Very good condition. Dark impression.